The aim of this study was to investigate organisational commitment in an organisation that had recently experienced organisational restructuring (a merger). The psychological contract that exists between employees and organisations is brittle due to many organisational changes that stem from organisational restructuring. When psychological contracts are breached, employees may experience reduced commitment to the organisation. The target population for this study consisted of all employees working at three recently-merged higher education institutions in the Nelson Mandela Metropolis (n=100) and a selfadministered questionnaire was distributed amongst staff. The results indicated that an increase in the number of positive human resource management (HRM) practices reported by respondents correlated with a decrease in violation and breach of the psychological contract, despite organisational restructuring. It was further revealed that effective management of the psychological contract is crucial during organisational restructuring, in order to maintain the commitment and loyalty of employees. The concept of the psychological contract has been broadly used in organisational psychology literature as a way of examining and investigating the changing relationship between employers and their employees. The psychological contract refers to the relationship between an employer and an employee with regards to the unwritten expectations that exist, not in a formal written contract, but in implicit expectations, often covertly held and infrequently discussed (D'Annunzio-Green & Francis, 2005). For example, an employee may do many things for their employer by putting in extra time at work, working hard and being loyal to their employer. In return she/he expects the employer to provide interesting work, respect, promotion opportunities, training and job security. This paper examines how HRM Practices, Organisational Commitment and the Psychological Contract interact in a postmerger situation in recently-merged further and higher education institutions in the Nelson Mandela Metropolis. Violation and fulfilment of psychological contracts are important to organisational performance, as violation has been empirically linked to the attitudes and behaviours of employees (Sonnenberg, 2006). The measures that employers undertake during restructuring can cause employees to feel that the psychological contract has been undermined. Managers will therefore have to pay closer attention to the management of the employment relationship and will need to ensure that their organisation is a good employer (Guest & Conway, 2004). The goal of this paper is to gain more insight into the role that HRM can play in facilitating healthier psychological contracts and, in turn, can contribute to organisational commitment, despite engaging in organisational restructuring. University mergers were implemented in 2003, after having been proposed in 2001. Overall, the exercise has cost more than R3Billion with questionable levels of success. Some mergers were more successful than others, with Pityana (in Dibetle, 2008) citing the University of KwaZulu-Natal, the University of Johannesburg and the University of South Africa as examples of successful mergers. This paper aims to assess the impact of mergers on organisational commitment in institutions of Higher and Further Education. This section will discuss the impact of HRM practices and organisational restructuring on the psychological contract, as well as organisational commitment as an attitudinal consequence. Research propositions and hypotheses will also be discussed and applied to the literature. There now is sufficient and well-established evidence that the application of HRM practices can be associated with employee organisational commitment and other positive employee attitudes. Shield (2002) suggests that HRM may be the most important element in ensuring merger success. These practices are strongly associated with a positive state of the psychological contract, which in turn is linked to a variety of positive behaviours and attitudes (Guest & Conway, 2004). Guzzo and Noonan (1994) relate HRM practices with the psychological contract and consider these practices as communications mechanisms. These authors strongly suggest that violation of the psychological contract stems from the organisation's HRM practices. HRM practices send signals that are interpreted by workers and are relevant to their assessment of the fulfilment of the psychological contract. One of the roles of HRM practices should be the creation and maintenance of psychological contracts between employees and their organisations (Sonnenberg, 2006). In times of restructuring, and specifically during mergers, the actions of HRM may inadvertently send hostile messages to the workforce - resulting in malcontent. Figure 1 suggests that, with the adequate application of appropriate HRM practices, violation and breach of the psychological contract may be reduced, which consequently should contribute to organisational commitment. When psychological contracts go unfulfilled or are perceived to have been violated, employees may experience reduced organisational commitment and/or stronger intention to quit and may behave in a counterproductive way (Brewster, Carey, Dowling, Grobler, Holland & Warnich, 2003). H1: There is a relationship between HRM practices and the psychological contract. Many South African further and higher education institutions found themselves in dire straits financially at the beginning of the 21s t century. According to Hay and Fourie, (2002) several institutions found it difficult to keep their doors open, and in an effort to survive, institutions reduced costs by cutting down on the number of faculties and by placing moratoriums on overtime pay, conference attendance, new appointments and staff redeployment. The South African Minister of Education proposed the merging of existing higher and further education institutions at a regional level to improve efficiency through reducing replication of services (Hay & Fourie, 2002). These changes placed pressure on the employment relationship and may have reduce employee commitment. Mergers and acquisitions have been a popular strategic tactic for organisations as they help to attain growth, profitability and diversification. In some cases, mergers have been a last resort. Mergers are extreme forms of organisational change and change is often perceived by employees as threatening, due to employees' fear of losing security. Goldman and Van Tonder (2006) claim that most mergers do not achieve the goals originally intended. Weber estimates that 50-60 per cent of all mergers fail within three years (1996, in Bligh & Carsten, 2005). This is largely due to not having sound employee relations or not adequately communicating the progress of the merger. With regards to the psychological experiences of academic staff in institutions that either have been merged or are in the process of merging, little research had been undertaken in South Africa up to 2002 (Hay & Fourie, 2002). Recent research at the University of Johannesburg (a recently-merged university) showed that in the pre-merger phase employees react with fear and uncertainty, although the reaction does subside if more information is made available and processes are formalised in a transparent way (Goldman & Van Tonder, 2006). Research has repeatedly shown that communication, job security, work-role stability and social support become more valuable during times of change and restructuring (Bellou, 2007), largely to allay the fears of workers. Employees become preoccupied with questions regarding what will happen to the organisation's structure, who they will be reporting to, how communication patterns will change and how restructuring will affect their pay and benefits (Bligh & Carsten, 2005). Mergers were found to be stressful life-events, even if the merging institutions are culturally similar (Cartwright & Cooper, 1993). This supports Goldman and Van Tonder's (2006) findings. With the rapid changes and the turbulent business environment organisations find themselves in, Pate, Martin and McGoldrick (2003) suggest that long-term job security in return for hard work has come under pressure. Mergers make contracts more prone to violation and breach and this contributes to lower organisational commitment and significant differences in commitment are normally found between the previously dominant institutions in newly merged institutions (Panchal & Cartwright, 2001). H2: There is a relationship between organisational restructuring and the psychological contract. H3: There is a relationship between organisational restructuring and employee organisational commitment. Organisational commitment can be defined as the relative strength of an employee's attachment to, or involvement with, the organisation where she/he is employed (Stup, 2006).  Affective commitment, which is an emotional attachment to the organisation and a belief in its values. Employees want to be part of the organisation and will go the extra mile.  Normative commitment, which is a moral obligation to remain with the organisation for ethical reasons.  Continuance commitment, which is the perceived economic value of remaining with the organisation, as compared to the perceived economic value of leaving the organisation. Research indicates that transactional contracts are related to continuance commitment, whereas relational contracts strongly correlate with normative commitment (Meyer & Allen, 1997). In other words, there is a link between the employee's expectations of what she/he feels she/he owes to the organisation and is owed by the organisation (the contents of the psychological contract) and organisational commitment. Figure 2 proposes that when there is adequate management and application of HRM practices, violation and breach may be reduced and to a certain extent, limited, making the contents of the psychological contract more relational and facilitating normative employee commitment. H4: There is a relationship between the psychological contract and employee organisational commitment. H5: There is a relationship between HRM practices and employee organisational commitment. The study was exploratory in nature and the target population consisted of all employees working at three recently-merged education institutions in the Nelson Mandela Metropolis (n=100). The sample consisted of academic, administrative, professional and technical employees. The researchers aimed to determine individuals' perceptions of the psychological contract by focusing on HRM practices, psychological contract breach and violation and to determine individuals' perceptions of the contents of the psychological contract by focusing on transactional and relational contracts. Respondents' levels of organisational commitment (attitudinal consequence of the psychological contract) were also measured and normative and continuance commitment were placed under scrutiny. The impact of organisational restructuring was also measured under a separate section. The questionnaire for the present study integrated the seven core HRM practices used in a Chartered Institute of Personnel and Development [CIPD] survey (Guest & Conway, 2004). These questions were transformed into statements rated on a fivepoint Likert scale. Both psychological contract violation and breach were measured, drawing on the work of Robinson and Morrison (2000). For the contents of the psychological contract, the only published measure that does in part capture exchange is Millward and Hopkins' (1998) Psychological Contract Scale (PCS), used recently in a revised form by Raja, Johns and Ntalianis (2004). Raja, Johns and Ntalianis' (2004) PCS was adapted for and included in the present study, in order to make a clear distinction between transactional and relational contracts and furthermore to assess the contents of the psychological contract from the employee's perspective. Only two items were included in the CIPD survey that measured employee commitment to the organisation (Guest & Conway, 2004). These two questions were transformed into statements rated on a fivepoint Likert scale for the present study and formed part of measuring general commitment as a consequence ofpsychological contracts. For the other components of organisational commitment, items were extracted and adapted from the original continuance and normative commitment scales. Each of the three scales of the three-component model comprises eight items (Meyer & Allen, 1997). The purpose of including these scales was to see if respondents scoring high on transactional psychological contracts indicated stronger continuance commitment and if those high on relational contracts indicated strong normative commitment.  They feel secure about their future employment in the organisation.  They trust their employer to look after their best interests.  They feel their workload is not too heavy.  They are clear what their duties and responsibilities are. To clarify, positive impact of organisational restructuring means that employees feel secure about their future employment, trust their employer to look after their best interests, feel that their workload is not too heavy and are understand what their responsibilities and duties are. The questionnaires were distributed to 124 employees with clear instructions on how to complete them. This allowed employees to complete the questionnaire in their own time and to submit them by the stipulated date. The questionnaires were also distributed door-todoor in order to explain the instructions more clearly and to address certain questions regarding the completion. An electronic questionnaire was also constructed and e-mailed to respondents. Respondents were given three weeks to complete and return the survey. In total, 100 completed questionnaires were returned and captured for analysis. This represents a response rate of 80.6 per cent, which is acceptable in an investigation of this scope. Both descriptive and inferential statistics were utilised for the data analysis. Reliability of the summated scores calculated in this study was determined by calculating Cronbach's coefficient alphas for all sections in the questionnaire. From Table 1 it can be deduced that many scales had Cronbach coefficient alphas above the threshold value of 0.7 which, according to Nunally (1978) is sufficient proof of the reliability of the applicable scale scores, whereas coefficient alphas above 0.5 can be regarded as acceptable for basic research. Item F19 was excluded from this calculation, as it showed a coefficient less than 0.3. 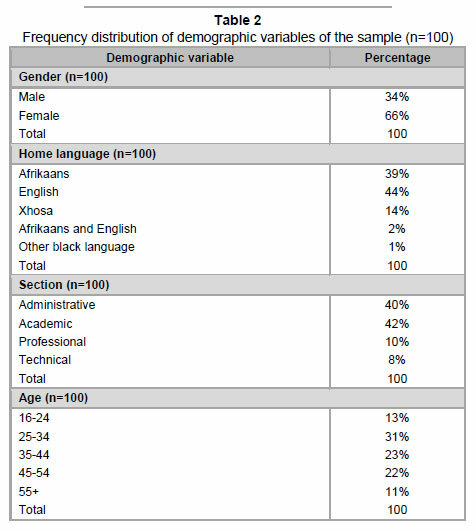 Table 2 shows the frequency distribution of the demographic variables of the sample. This section will reveal and discuss the results obtained from the research study. Both descriptive and inferential statistics will be discussed. With regards to HRM practices, Table 3 shows that most respondents (52%) indicated that when new positions come up in the middle and senior levels of management, their organisation normally try to fill them with people from inside the organisation. According to Guest and Conway (2004) internal staffing can boost commitment and a greater propensity to stay with the organisation. Table 4 shows, that when respondents were asked whether their personal performance had been appraised to their satisfaction during the past year, 36 per cent disagreed, whereas a further 18 per cent strongly disagreed with this statement. In other words, the majority of respondents (54%) were not satisfied with their performance appraisal ratings and according to Rousseau (1995) performance appraisal feedback sends a clear message to employees of what the organisation expects from them and what they could expect in return. With regards to psychological contract breach, Table 5 shows that 13% of respondents strongly disagreed that their employer had succeeded in fulfilling the promises made to them when they were hired. A further 36 per cent of respondents disagreed with this statement. In contrast, 16 per cent of respondents agreed with this statement, while a meagre 6 per cent of the sample strongly agreed with this item. This indicates that the majority of respondents (49%) felt that the promises made by their employer had been broken. For psychological contract violation, Table 6 shows that a total of 43 per cent percent of all respondents indicated that they felt frustrated by the way they had been treated by their organisation. Conversely, 40 per cent of the sample did not agree with this statement. It is evident that the perceptions of psychological contract violation are balanced. Those with a more transactional contract may have a less averse reaction to breach, making perceptions of violation less likely (Conway & Briner, 2005). The strong wording of this question may have tempered the response. The contents of the psychological contract component of the measure determined both relational and transactional aspects. With regards to relational contracts, Table 7 shows that 25 per cent of respondents strongly disagreed that they would be promoted, given length of service and 22 per cent disagreed with this statement. Furthermore, 27 per cent agreed, whereas a scanty 4 per cent strongly agreed with this statement. To summarise, the majority (47%) of respondents indicated that they did not expect to gain promotion with length of service. This may indicate a shift from the relational side towards the transactional end of the continuum. When they realise that there are limited opportunities to work elsewhere, people develop continuance commitment (Francesco & Gold, 2005). Table 8 shows that 34 per cent of respondents agreed that they had too few options to consider leaving their organisation. In addition, Table 9 shows that 38 per cent of respondents agreed that one of the few negative consequences of leaving their organisation would be the scarcity of available alternatives, whereas 10 per cent strongly agreed with this item. On the other hand, 11 per cent strongly disagreed, whereas 23 per cent disagreed. From the above it is clear that most respondents felt that they have too few options to consider leaving their organisation (45%) and available alternatives to work elsewhere are scarce (48%). As the state of the psychological contract is based on fairness, trust and delivery of the deal (Guest & Conway, 2004), trust reflects the employment relationship (Atkinson, 2006). The results in Table 10 indicate that 33 per cent of respondents agreed that they did not trust their organisation to look after their best interests, whereas 25 per cent strongly agreed with this statement. A meagre 6 per cent strongly disagreed, whereas 16 per cent of all respondents in the sample disagreed. To summarise, the majority of respondents (58%) indicated that they did not trust their organisation to look after their best interests. This study of merged organisations, confirmed Bellou's (2007) findings that both organisational obligations and contributions changed during mergers and acquisitions. With regards to job insecurity, Table 11 shows that a substantial 37 per cent agreed that they felt insecure about their future employment in their organisation, whereas only 12 per cent strongly agreed with this statement. However, at the other end of the spectrum; 10 per cent strongly disagreed, whereas 19 per cent only disagreed with this statement. This indicates that most respondents (49%) felt insecure about their employment. As the hypotheses are based on relationships, Pearson product moment correlations were calculated to measure the degree and direction of the relationships between the variables. The correlation matrix for all the variables is shown in Table 12. Correlation coefficients greater than .197 (r > .197) are statistically significant, where coefficients greater than .300 are practically significant (r > .300). For discussion purposes, only the correlations that are statistically and practically significant are extracted and reported. The results indicated an inverse relationship between HRM practices and breach of the psychological contract (-.611). It can be said that the more HRM practices reported by respondents, the less the breach of the psychological contract. The results indicated an inverse relationship between HRM practices and psychological contract violation (-.562). What was interesting to note is that a positive correlation was found between HRM practices and relational psychological contracts (.670). In other words, an increase in the number of HRM practices reported by respondents indicated an increase in relational contracts. These findings provide support for hypothesis one. Hypothesis two is supported. An inverse relationship (-.550) was found between organisational restructuring and breach of the psychological contract.  They felt secure about their future employment in the organisation.  They trusted their employer to look after their best interests.  They felt their workload was not too heavy.  They clearly understood what their duties and responsibilities were. When there is a positive impact, there is a less harmful influence of organisational restructuring. The results indicate that when a more positive impact of the organisational restructuring was reported (more job security and trust etc. ), less breach and violation were reported by respondents. In addition, a positive correlation (.514) was found between the organisational restructuring and relational psychological contracts. This means that the less harmful the impact of the organisational restructuring (in this case a merger) reported by respondents, the more relational the psychological contract. The results indicate that when a more positive impact of the organisational restructuring (more job security, trust, etc.) was reported, there is an increase in general commitment (.509) and normative employee commitment (.247). In other words, a positive correlation was found between organisational restructuring and employee organisational commitment (i.e. general and normative commitment). Hypothesis three is therefore supported. Table 3 shows that there is an inverse relationship between psychological contract breach and general employee organisational commitment (-.597). Furthermore, an inverse relationship exists between violation of the psychological contract and employee organisational commitment (-.592). To clarify, the findings suggest that when breach and violation increase, employee commitment shrinks. In addition, an inverse relationship (-.229) exists between breach of the psychological contract and normative commitment. The same was found for violation of the psychological contract and normative employee commitment (-.226). This suggests that when violation and breach increase, normative commitment decreases. The relationship may become more calculated and research indicates that transactional contracts are closely related to continuance commitment (Meyer & Allen, 1997). When psychological contracts go unfulfilled or are perceived to have been violated, employees may experience reduced organisational commitment, stronger intention to quit and counterproductive behaviour (Brewster et al., 2003). A positive correlation (.711) was found between relational psychological contracts and general employee organisational commitment, as well as for normative employee commitment (.413). These findings support hypothesis four.  With an increase in the number of HRM practices reported by respondents, there is an increase in general employee organisational commitment.  When HRM practices reported by respondents increase, there is an increase in normative employee commitment. Although many studies suggest that HRM practices are related to employee commitment, there are some studies that found the links between actual HRM practices and work attitudes were mediated by perceptions of the organisation's commitment to HRM activities that benefit employees (Meyer & Smith, 2001). In periods of radical change like mergers, acquisitions and downsizing occurring in organisations, employees' relationship to the organisation changes and commitment decreases. Any number of psychological contracts at several levels (Rousseau, 1995) have been upset by large-scale workforce and organisational changes. Sensible managers should pay specific attention to the management of the employment relationship. The research findings indicated a positive correlation between the number of HRM practices reported and general employee organisational commitment. This means that an increase in HRM practices indicates an increase in the commitment of staff. The results also indicated that with an increase in HRM practices reported, violation and breach of the psychological contract decreased. As with most research, this study is subject to a number of potential limitations. The outcomes of this study may not be able to be generalised to other education institutions, since the organisational culture may be very different in other institutions. In addition, even though a sample size of 100 is adequate for statistical analysis, caution must be exercised in generalising the findings beyond the associated hypotheses. 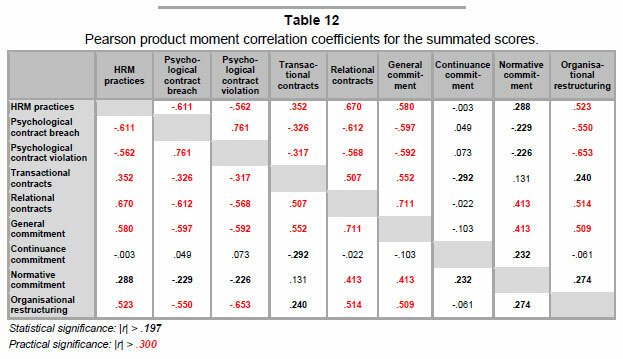 The Pearson product moment correlations only indicate a relationship - it does not explain why the two variables are related. Possible future directions for this research include a larger sample and multivariate analysis. In the era of the new psychological contract, the findings suggest that organisations will have to pay closer attention to the management of the employment relationship. Mergers and acquisitions are extreme forms of organisational change. Under these circumstances and given the results of the present study, the psychological contract becomes brittle and prone to breach. This means that careful management of the psychological contract is needed due to these turbulent times. Organisations face the challenge of maintaining the commitment and loyalty of their employees, as promotion opportunities and job security are fading away.